browser. fasTun makes the web experience faster by compressing web pages (making them smaller) before sending them to a user's web browser. Because there is less data to send, the web browsing experience is faster. FasTun also speeds up the web browser by blocking advertisements and compressing images to minimize the amount of data needed to display web pages so that Firefox can load them in less time. 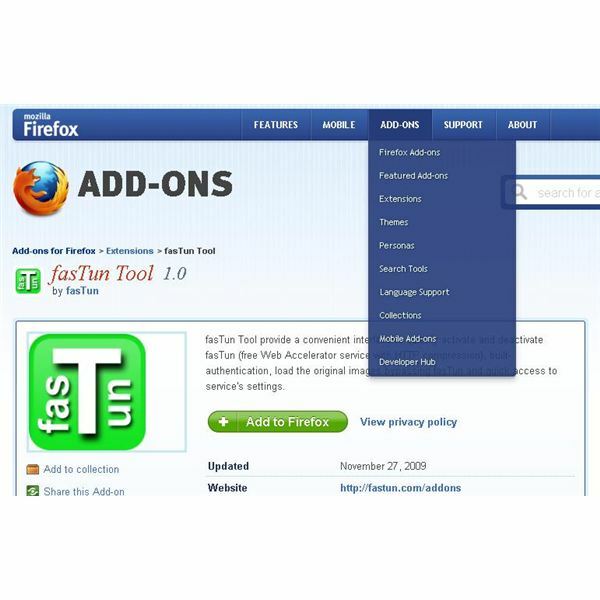 The fasTun tool is available from Mozilla Firefox add-ons and requires a user to have a fasTun user account. Because this is a free service, openings are not always available so users may need to try other Firefox web accelerators while waiting for an opportunity with fasTun. FastestFox is no longer available. FastestFox is Firefox web accelerator that speeds up the user experience by using parallel downloads and auto-loading of linked web pages. FastestFox has a download option for media on a page that allows users to save videos and other content to their computer so they can view them in a faster, more consistent manner. This productivity enhancer is available as a free download from the Mozilla Firefox addon website. the original Fasterfox, Fasterfox Lite comes with many presets designed to accelerate web browsing through broadband connections. 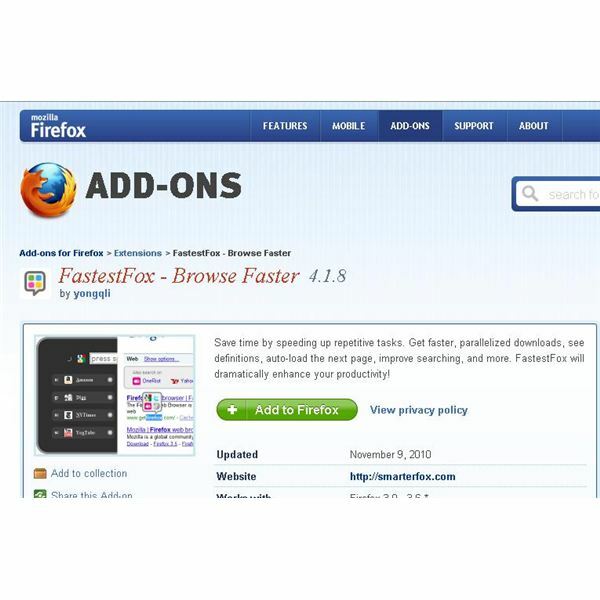 Besides the built-in settings for acceleration, users can set their own preferences to make Fasterfox a Firefox accelerator that is necessary for almost every user. 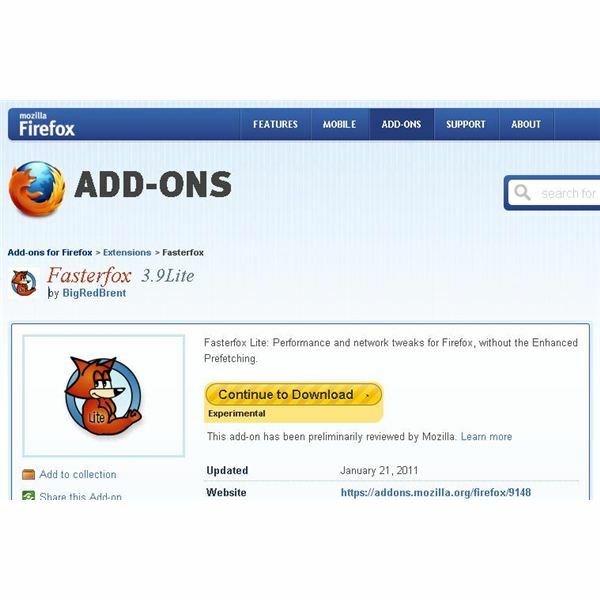 Acceleration techniques such as timed content reflowing, IP version 6 DNS, SSL pipelining, and user interface responsiveness allow Fasterfox Lite to deliver a web browsing experience that is significantly faster than Firefox's normal operation. CProxy is a free web accelerator that works with Firefox and other web browsers to conserve bandwidth and accelerate the users' web experience. To use CProxy, users must first sign up at the CProxy Website. Although a limited version of the service is available for free (32-256 kbps), premium users can receive compressed and optimized web streams at speeds of 756 kbps. Besides reducing the data needed for users to load web pages, CProxy also acts as an anonymous proxy that does not pass users' IP addresses on to the web servers they visit. Cost for CProxy is listed as $35, but the website also accepts other currencies for payment. All users of CProxy must download an installation program (Windows only) that manages the connection between a user's machine and the CProxy service. Which Firefox Web Accelerator is Best? FasTun by far, seems to be the most effective and popular web accelerator for Firefox. Unfortunately, it has a limited amount of user slots available, meaning that not everyone can sign up at all times. CProxy is probably the next best solution, with its primary draw back being that users must pay to get faster speeds. The other Firefox web accelerators seem to rely primarily on tweaking browser settings and, therefore, seem to be the least effective, although both FastestFox and Fasterfox Lite can both dramatically improve browser performance.